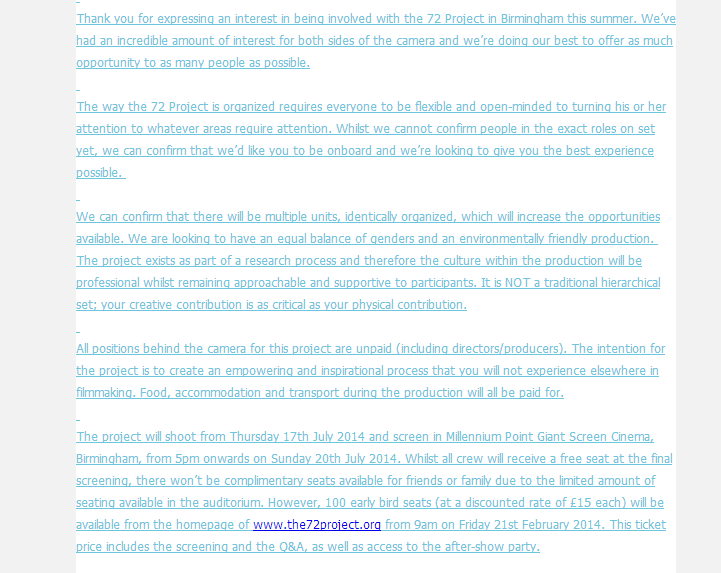 Confirmation email to take part in the 72 hour project as member of the crew although exact position is unconfirmed by actively applying for place through the website. The project focuses on creating a feature film within 72hours. Previous projects include ‘Watching and Waiting’ shot in Ireland and ‘The Ballard of Des & Mo’ shot in Australia. The recent feature will be shot in Birmingham from Thursday 17th July 2014 and screen in Millennium Point Giant Screen Cinema, Birmingham, from 5pm onwards on Sunday 20th July 2014. A large team will be used which will be split into multiple units, identically organized, which will increase the opportunities available.